In a speech given on December 6, 2011, Barack Obama, the Debtor-In-Chief, called for a Level Economic Playing Field. “This isn’t just another political debate. This is the defining issue of our time. This is a make-or-break moment for the middle class, and all of those who are fighting to get into the middle class,” he said. “At stake is whether this will be a country where people can earn enough to raise a family, build a modest savings, own a home and secure their retirement.” Yeah whatever! His populist tone, however, has fallen mostly upon deaf ears, as America has come to realize that the $5 trillion of debt, which he has racked up over the last 3 years, is the real defining issue of our time. And that in spite of all of his irresponsible borrowing and spending, Obama has delivered next to nothing in the way of improved permanent living standards for any American. Newsflash! The recession ended in June of 2009. The economic crisis is over. What we are witnessing at this point is what an economy looks like, some 29 months after a recession has ended, when an emaciated government Administration has miserably failed its people. No, this isn’t a recession, it’s an Obama recovery. If things aren’t moving fast enough for you, it just may be that the Class-Warfare-Instigator-In-Chief has been focused more on disarming the economy than fortifying it. Those who are content with waiting on Obama to remake America, in his own image and likeness, will find themselves waiting a long time, as it originally took some 244 years to get where we were prior to his anointing. But as for the rest of us, we don’t have to wait any longer than November of 2012 to bury Obama’s dated ideals of crony capitalism and political pandering back underneath the trash heap from which they emanated. As the self-ascribed millionaire, and so called, spokesman for the poor and downtrodden, engages in an irrational personal conflagration to extend a contrived $8 to $16 per week payroll tax cut for most working Americans, while at the same time bankrupting the nation as a whole, most of us realize that it’s going to take a lot more than a temporary handout to fix what is likely a systemic problem. Does Obama seriously believe that someone hearing his class-warfare vitriol will suddenly be inspired to run out and enroll in a G.E.D. program, or college; or to start a new enterprise? Because I don’t think his divisive tone cuts the mustard. Will an $8 to $16 per week bounty seriously be enough to usher us into the Promised Land? Yeah, right! So Obama has chosen to make his last stand — the act of doling out a one-year, deficit-financed, premature social security distribution (for the 3rd year in a row), while at the same time handing each American citizen our “fair share” of a national debt, that is now $48,254 for each and every one of us. But it seems to me that he might want to take care of his own issues first, since he (Obama) has already inflated the national debt by 50% of the amount incurred by the first 43 presidents, in just 3 years. The thought of another nickel of reckless spending coming out of this White House makes me want to see him rot in a federal penitentiary, for the rest of his days. After all, has he not essentially stolen the future away from my children and grandchildren? What is the Playing Field? So let’s look at the facts surrounding what would be involved in leveling the so called playing field, as Obama so ineptly echoes. According to the Bureau of Labor Statistics (BLS), the unemployment rate among those, 25 years of age and older, who have attained less than a high school diploma is a whopping 13.2%, while it is only 4.4% for those with a Bachelor’s Degree or higher. 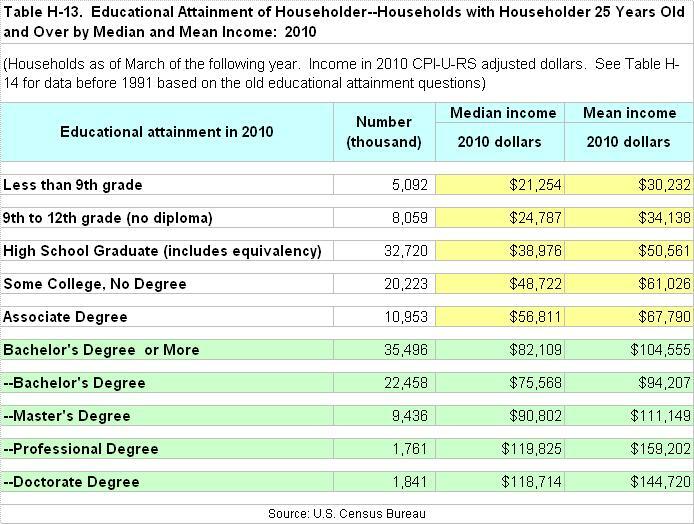 And according to the U.S. Census Bureau, households with a householder 25 years old and over, with less than a high school diploma have median incomes of $24,787, while those with a Bachelor’s Degree or higher have median incomes of $82,109. So what does that tell you? It tells me that some people achieve more than others, but it doesn’t tell me that the playing field is not level. The following table, courtesy of the BLS, was split up into four parts, mainly due to the overall size, but also to focus on the characteristics of each category. First, as of November of 2011, the unemployment rate among those age 25 and over who have attained less than a high school diploma was a colossal 13.2%, while the labor force participation rate was a mere 47.0%. That means that while some 10.2 million in this category were employed, another 1.5 million were unemployed, and that there were another 13.2 million people somewhere out there who never made it through high school. Although this is the smallest of the four categories, one’s chances of employment are greatly diminished by not finishing high school. Next, according to the BLS, the unemployment rate among those 25 years of age and over who are high school graduates was 8.8%, which is still rather high, while the labor force participation rate was 60.3%. That means that while some 33.8 million in this category were employed, another 3.3 million were considered unemployed. Note: It’s curious that the overall unemployment rate dropped from 9.0% in October 2011 to 8.6% in November of 2011, primarily due to the fact that 315,000 workers dropped out of the labor force, and that the civilian labor force among high school graduates — with no college, fell by 302,000. Is this just a coincidence? In comparison, for those equipped with a high school diploma, along with some college or an Associate’s Degree, the unemployment rate was 7.6%, which isn’t all that great, but better than the former categories, and the labor force participation rate was also an improvement at 68.4%. This means that while some 33.9 million in this category were employed, another 2.8 million remained unemployed. Finally, among those with a Bachelor’s Degree or higher, the unemployment rate was a mere 4.4%, while the labor force participation rate was a tolerable 76.0%. What a dramatic improvement. 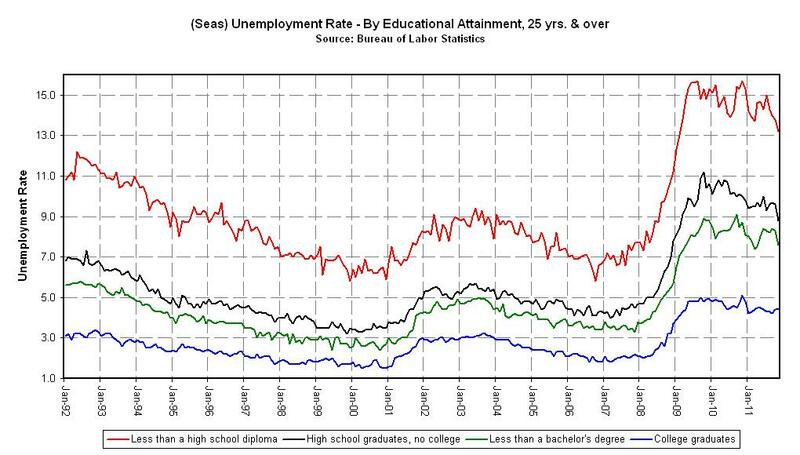 This means that some 45.0 million college graduates were employed, while just 2.1 million were considered unemployed. Thus, one’s chances of employment are immensely greater after attaining a college degree. So from the above, we can state that we have a civilian labor force of 132.7 million people, 25 years of age or older, and that among these, as of last month, 123.0 million were employed, and 9.7 million were unemployed. And as far as the unemployed, 2.1 million have a Bachelor’s Degree or higher, 2.8 million attended some college, 3.3 million stopped after high school, and another 1.5 million never graduated from high school. Among those who are employed, 45.0 million are college graduates, 33.9 million attended some college, 33.8 million stopped after high school, and 10.2 million dropped out of high school. What should be rather obvious from the preceding tables is that the higher one’s level of education, the greater one’s chances of employment, especially in a tough economy. So how does Obama propose to level this playing field? Will he give non high school graduates honorary diplomas? Or will he take money and opportunities away from achievers and hand it over to non-achievers? For the most part, all I ever hear from Obama is nonsense such as, ‘tax high achievers and give a portion of their earnings over to non-achievers’, or ‘tax the rich, and give $8 to $16 per week tax cuts to those who already have jobs’. But how would either method fix the achievement inequality gap which is evident in the preceding tables? They won’t. You see, there is no way to make this playing field any more level than it already is. I mean it is what it is. If you want a good life, the first step is to finish high school, and if you don’t, it’s not the responsibility of those who did to take care of you. If you want to do a little better, then plan on attending college because, even if you don’t finish, your life will be immensely better. Heck, I’m not ashamed to say that I didn’t finish college until I was 32 years old. And I managed to trudge through it with a full-time job, and a wife and four children at home. Had I not done so, my advancement would have been limited at best. And when I finished, I didn’t have a dime of student loan debt. So it can be done, and it must be done in order to obtain anything in this society. That’s just the way it is. 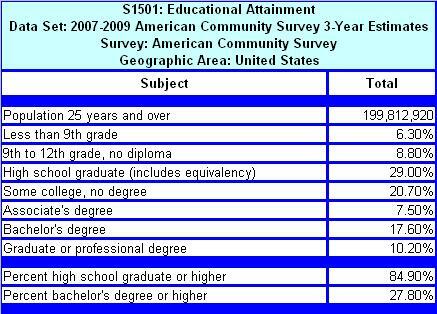 Digging a little deeper, according to the U.S. Census Bureau’s 3-Year Estimates, among those 25 years of age and over, only 27.8% attained a Bachelor’s Degree or higher, while 15.1% didn’t make it through high school (see table below). According to the data, 29.0% graduated from high school (including equivalency), 20.7% attended some college but did not get a degree, 7.5% attained Associate’s Degrees, 17.6% earned Bachelor’s Degrees, and 10.2% obtained Graduate or Professional Degrees. So although 84.9% of Americans graduated from high school, a much smaller percentage went on to complete college. So that brings us to the big question: Does one’s level of educational attainment make any significant difference in economic standing? Well, according to the U.S. Census Bureau’s 3-Year Estimates, we can see (in the table below) that the poverty rate among those with less than a high school diploma is 24.5%, while it was 11.8% among high school graduates, 8.2% for those with some college, and only 3.7% for those with a Bachelor’s Degree or higher. So the chances of living a life in poverty are greatly enhanced for those who fail to graduate from high school, while being very slim for those attaining at least a Bachelor’s Degree. So does this mean that the playing field isn’t level? Do high achievers have a responsibility to take care of non-achievers? Did some of us start out on a different playing field, other than kindergarten? And is it possible for Obama’s wealth redistribution vision to turn back the hands of time and place everyone back on Square One? The answers to all of the above — a solid “No”. As I mentioned in, Obama’s Square Deal and Just Deserts, and according to the U.S. Census Bureau, in 2010, households with a householder 25 years old and over with less than a 9th grade education earned median incomes of $21,254 and mean incomes of $30,232, while those with some college earned median incomes of $48,722 and mean incomes of $61,026, and those with a Bachelor’s Degree or higher earned median incomes of $82,109 and mean incomes of $104,555 (see table below). So anyone who wants to earn their ‘fair share’ should be prepared to plot their ‘own course’, and to complete the necessary steps. How high you reach, and how you get there is simply a matter of free will. So unless Obama is proposing to take away free will, or to somehow make college education mandatory, all of this “level playing field” rhetoric is just smoke. I will go ahead and submit that America is firmly planted on an even playing field. It begins in kindergarten and ends where it ends, due to personal choices, parental upbringing, and life experiences. I will also state that high achievers do not owe non-achievers a single solitary dime. Nor is it the responsibility of the federal government to improve the lives of those who make bad choices. Sure, government can and should encourage upward mobility, but as the saying goes, “You can lead a horse to water, but you can’t make him drink.” It is not the federal government’s responsibility to knock high achievers back a few steps so that non-achievers can catch up. Sorry, but it doesn’t work like that. Just like God helps those who help themselves, governments should only venture to help those who help themselves. Now will somebody please explain to me how giving out $8 to $16 per week deficit-financed handouts (i.e. the payroll tax cut), to people who are already working, will manage to level the playing field for the 11.7 million civilian workers who, for one reason or another, didn’t bother to graduate from high school? Or for that matter, for the 37.1 million who chose to climb no higher than high school? My short answer is that it won’t. In fact, nothing that Obama has been spewing will miraculously turn lower levels of educational attainment into higher learning, nor bigger paychecks. For all his rhetoric, Obama hasn’t inspired one American to pick themselves up by the bootstraps and try to make progress. In truth, all that I’ve heard from Obama are the following misnomers — society isn’t fair, and under-achievers are owed something by those who have been more successful. Yet it turns out that the most successful members of our society are mainly those who finished high school, and went on to graduate from college. Hopefully someone in the ‘class’, that either didn’t finish high school or is thinking about dropping out, will be inspired by what you have just read, to indeed pick “yourself” up and move forward. And I would to God that some Ronald Reagan protégé would take up the mantle, and again speak those words that so inspired me to pick myself up by the bootstraps, return to school, and seek a better life. Great post! I am a firm believer in the Knowledge Based Economy and this graph at the top of the post shows the value of a higher education. Gone are the days when the US was the prime manufacturer for the world and low skill work was abundant. We have to realize that US manufacturing is moving to more technical job descriptions and we must train our youth accordingly. China and India are not going away and we need to recognize this and make the needed changes in our country. Unions have destroyed much of our manufacturing sector and they too need to realize most of those jobs are not coming back. There is a reason their membership roles are dwindling. If you care to, I wrote a post about this from a manufacturing perspective. It's obvious, isn't it, that if half of our nation's household are below the median for household income, that we'll have to take steps to fix that disparity. Won't we? Who is we? And how would you propose to “fix” it?